Embark on the underwater journey of a lifetime! Already a diver or totally new to the game? 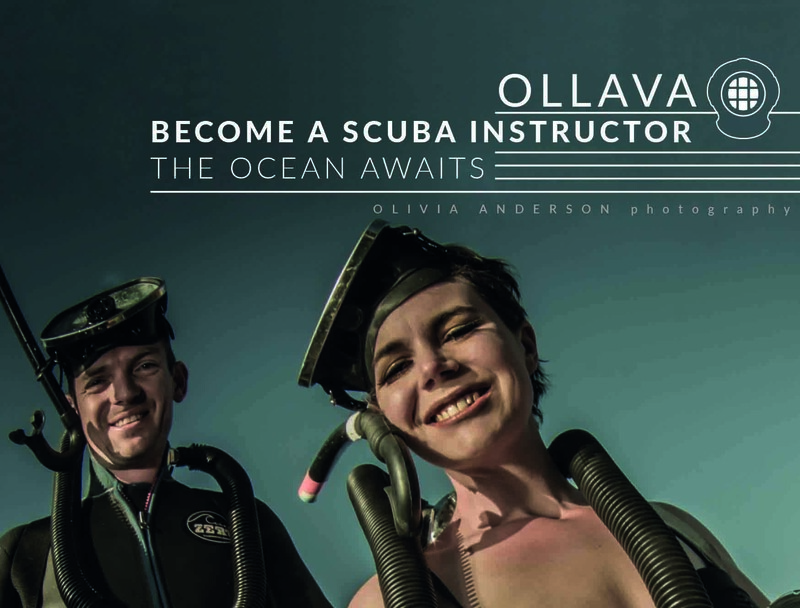 Ollava and Oceanus welcome you for a full-fledged internship during which you’ll develop all the skills necessary to become a professional dive instructor. You can walk through our doors not knowing a mask from a regulator and come out a knowledgeable and trustworthy professional PADI Diver. The Roman poet Juvenal once wrote: “Mens Sana in Corpore Sano” which translates to “A sound mind in a sound body”. As a diver, it is our conviction that should become your mantra. When we are not diving, we should be investing time in our body and in our mind, further our horizons and push our limits. We’ll gladly help you on your way with those through physical exercise and ad hoc education. We run our internship from Simon’s Town on the Western side of False Bay, Cape Town. This quaint little coastal town is about 40 minutes away from the City Bowl and offers the best of both worlds when it comes to diving. You have the furious beauty of the Atlantic Ocean, but the milder temperatures offered by the warm Aghulas current and the shelter the horse shoe shaped False Bay offers. From wrecks to sharks, from shallow to deep, the dozens of dive sites will fulfil every diver’s needs. The mountain ranges all around offer amazing hiking opportunities and you are off course a stone’s throw away from one of the hottest surf spots in the Cape, Muizenberg. You will have the option to stay with us for the duration of your internship. You will literally be living, breathing and eating scuba, forging life-long friendships along the way. The people you’re starting out with will be the people you’ll keep on bumping into randomly in all corners of the world. Divers are a close knit bunch, and you’ll love your time spent with each other and with us. As a qualified, but more importantly accomplished diver, the world is literally your oyster. PADI dive professionals are in high demand worldwide. We will gladly help you on your way by vouching for you and organising oversea job opportunities. We will give you all the tools available to spread your wings and explore the world whilst diving. This is the foundation phase, you are at the start of your journey and will be given all the tools needed to advance to the next phase organically. This is where the good habits are developed and when you’re being trained to develop a proper philosophy that will help you become the absolute best dive professional you can be! During this course, you will be taught all the theory you need to know about gear, diving habits and the physics and physiology behind diving. Upon mastery, we will take you to a confined water environment or pool to help you develop the actual dive skills you’ll need to master. The course is developed in such a way that you are trained to handle all situations, from flooding masks to helping out your buddy underwater. Once everybody’s comfortable with all the skills and theory, you’ll go out in the open water and qualify as a diver. As an Open Water diver, you will be allowed to dive with any other qualified diver up to a depth of 18 meters. This course consists of 5 open water Adventure dives, each specifically focussing on one aspect of diving. You are given a certain liberty to choose what you would like (picture of organigram here). The ones that are mandatory are the navigation and deep adventure dive. Your choices from there onwards are varied and only limited by regional restrictions, really. From wreck, to underwater photography, to search and recovery, you can decide which aspects of diving attract you and work towards acquiring knowledge in that specific discipline. This course is important as it will help you decide what you find exciting underwater from a very early stage. It is also a course where you will not be led by the hand as much as you where during your Open Water Course. You are, after all, a qualified open water diver now. You know how to handle yourself underwater. Through the course of our diving together, we will off course not limit ourselves to just 5 adventure dives as we want you to have as broad a base as possible as a diver. This is honestly one of the most fun courses you’ll follow in the early phase of your development, by which we mean it’s even more fun than all the other fun stuff you’ll be doing. You are now not only a qualified diver, but one that is slowly developing his or her own voice. You know what you like. It is now time to pull the curtain back a little bit. The focus in this course is no longer on you, but how you can help your fellow diver in time of need, big or small. Through a series of exercises set to simulate real life scenarios as accurately as possible, your instructors will teach you how to react to emergency situations. It is no longer about the perfect skill reproduction. We’re not teaching you how to dive, we’re training you to act in a prudent way to help somebody. This can be as easy as a talk before a dive or as in-depth as surfacing an unconscious diver from the bottom. We will also give you the tools necessary to actually attend to injury in a first aid course which will be run in the same life-imitates-life spirit as the rescue course. This is the first introduction to the responsibilities that will befall you once you have become a pro and a very important course to take seriously. Specialty courses are an interesting concept. It starts with your Advanced Open Water Diver Course, where every Adventure Dive you’ll do has the same requirements as the first dive of each distinctive specialty. So right of the bat, the choices you’ve made during that course can totally sell you on an idea. You really enjoyed that wreck Adventure Dive? Get the wreck specialty. The cool thing about these specialties is that they prepare you well for when you become a die instructor further down the line. If you’ve done the course yourself from an early stage in your development, by the time you can start teaching them, it will come to you naturally. As an added value, should you wish so, you can apply for the Master Scuba Diver rating once you’ve done 5 specialties and logged 50 dives. Barring the actual courses, we will spend a lot of time in the water with you, getting you experiences in our waters and introducing you to all of our dive sites. We will evidently do more than scuba diving, with intellectual and physical development also forming a big part of your day to day. At the end of the first phase of your internship, you will have properly experienced the customer side of diving. You’ll understand the customer’s journey through the system and you will have experienced the service provided by al the professionals around you. Now it is time to join the ranks of the professionals. Welcome to the crew, Dive Master in Training! The dive master training in itself is pretty straight forward. Through various workshops, you will be introduced to the intricacies of being a Dive Master: From your role as a dive master in the PADI structure to your duties as a part of any dive team. We will expand on your knowledge of physiology, physics and the environment and get you better acquainted with gear and maintenance. You will, naturally, be doing the majority, of your training in the water. As you’ll learn, a Divemaster is an integral part of any training program. As such, you will be shadowing instructors throughout their courses, learning the ropes of working with untrained divers and understanding what is expected of you. There will be practical assessments as well such as stamina tests, a mapping project, dive site management projects, deep dive scenarios and rescue scenarios, to name but a few. But by this point, these will be mere formalities as you will have been diving intensely with us for a good three months. Once you’ve qualified as a Divemaster and we are happy that you have the confidence to successfully work with customers without guidance, you will! That first dive you’re leading solo is going to be one you’ll never forget. You will have acquired the necessary knowledge to lead people into the water, or refresh their skills in the pool, and they will trust you. This is where the fun starts, this is where you start building your identity as a dive professional, and this is you embarking on the journey to becoming an instructor. Through our training and through your own commitment, you will take ownership and never look back! You will be the link between the instructor and the students. You know all the stuff the instructor is teaching and could really do it yourself, but that is missing the point of being a Dive Master. Real life experience, in general, shows that people are often wary of confiding into a direct authority figure. It is not because they are unapproachable or horrible people, it’s just in our nature to not want to look foolish in the eyes of our teachers. You must understand that through all you are doing during your training, you are developing as that intermediary, the confidant of your divers. You are the one leading them assuredly on their fun dives, you are the one helping them out with their gear and questions and you are the one reassuring new divers with an earnest smile and an encouraging nod. One day, you will be an instructor yourself and you’ll come to rely on your Divemaster. So be a good Divemaster yourself. Here we are, you’ve learned how to dive and you’ve learned how to lead. Now it is time to learn how to teach. We are going to prepare you for the Instructor Development Course (IDC) so that you can walk in there knowing that you’ll walk out as an instructor! The Instructor Development Course is a ten day program run by a Course Director. During these ten days, you will spend all your time either in the classroom preparing for the theoretical exam or in the pool, preparing for the practical exam. Your knowledge of the PADI standards will be fine-tuned to Porsche like levels of accuracy and you will be shown not only how to understand the theory of diving but also how to teach it. In the water, you will refine your skill demonstration techniques, learn how to pick up on common mistakes and correct them and overall how to control a group of learners in a safe way. At the end of your IDC, you will go to the Instructor Examination. This 2 day examination consists of written exams, pool session demonstration skills and open water skills. Upon successful completion of the IDC and the IE, you will be qualified as an Open Water Scuba Diver Instructor. You will submit your file to PADI and wait for your Instructor number, which is the same as your Divemaster number, to be confirmed. Congratulations, welcome to the life of a professional diver! You have been with us for 6 months know, we’re not going to just throw you in the lion’s den and hope for the best. Before the IDC even starts, you will already be prepared by us over a two week period. We will make sure you know every skill demonstration inside out, that you are familiar with the more common mistakes new divers make for each skill. Your theoretical knowledge will be sharpened through hands on workshops and team building contests. You will spend as much time as possible in the water with us. These two weeks are about you and getting you ready so that the IDC and IE become nothing more than a formality. So ask us anything you need, and we will oblige. Once again, you take out of it what you put into it, so we will not chase you. Part of being a professional is understanding your own strengths and weaknesses and acting accordingly to address what needs addressing. We cannot do the IDC in your stead, but we can do anything in our power to help you confidently sign up. Throughout every phase of tour scuba career development program, you will receive ad hoc theory sessions and have to complete assessments as defined by the different PADI courses. These will be done organically and interactively as you progress as a diver. By the time you reach the Dive Master and Instructor level, you will have assimilated and been thoroughly tested on all the necessary knowledge to become a trustworthy and competent dive professional. But beyond that, we will want to make sure you get as much additional information and teaching as possible through various workshops on specific aspects of the daily life of a dive professional. We will give you all the tools you need to act as a competent guide and person of trust both on land and underwater. In the end, you will be an integral part of any dive organisation, anywhere in the world! Beyond the theoretical development and pure diving development, we want to make sure you develop the necessary skills to become a full-fledged and, indeed, much needed member of your dive community. we will organise games, hikes and assignments to teach you how to work in teams and how to think on your feet. through a running and swimming program as well as with the help of a personal trainer. you are the dive professionals of the future, it is only normal you get a taste of what it is like to interact with customers and fellow divers in a real life environment. You will shadow actual courses, partake in actual sale pitches and gain invaluable knowledge on the work floor. Assessment of all your PADI courses will be done by your instructors throughout the phases 1 and 2. We will regularly tough base with you on fields we feel need improvement but also commend you where you’ve achieved mastery. This course is not easy, but it is also not inhumanely hard. At the end of the day, you will get out of this program as much as you’re willing to put in. After you’ve gone through our program, going into the IDC and IE, we’re confident you’ll have mastered all you need to have mastered and will be a competent, self-sufficient, mature diver. Fully ready for the live of a scuba professional. Assessment goes both ways, we are open to suggestions at all times and will gladly implement them if they’ll benefit the program.